Each month I like to pick a few themes and then plan some activities around them for Hailey and I to do together. For the month of April our themes are going to include weather, spring and farm animals. Stay tuned for the different activities and crafts we do this month. In addition to that I will also concentrate on the number 1, the color white and the shape oval. Every two weeks I also introduce a new letter. 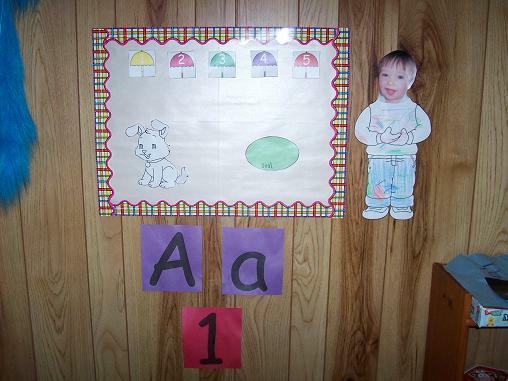 I have a little area set up in Hailey’s playroom with the different number, color, shape and letter I am focusing on. I will try to keep up and post the activities we do each day. 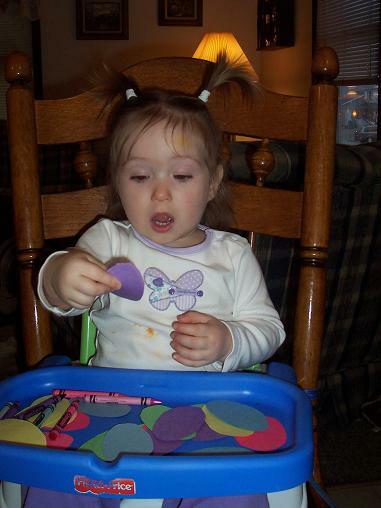 This year the Easter bunny brought Hailey some playdough. Now I think I know what lots of moms out there are thinking- it is just so messy- why would anyone ever give their child playdough? Having worked in day care and pre-k, I do know that playdough can create quite a mess. But do you know what else I have learned about playdough? It can usually buy several minutes in a row of quiet play. I think that around 18 months is a good time to introduce playdough. At this stage your toddler will probably just want to pat, poke and squeeze the playdough. 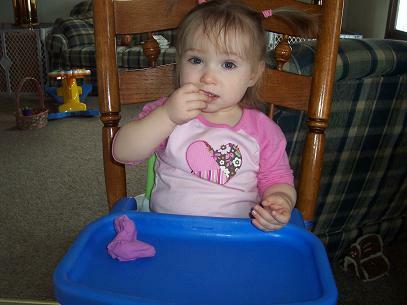 So, we got the playdough out the other day for Hailey to try it out. 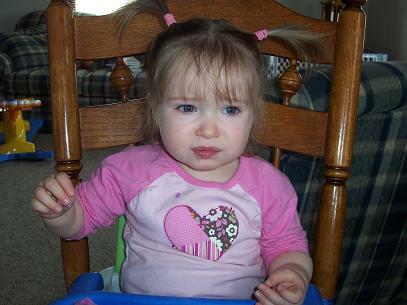 Toddlers like to taste everything, so I expected that Hailey would have to try a bite of her playdough. Once she realized how bad it tasted that put an end to that. 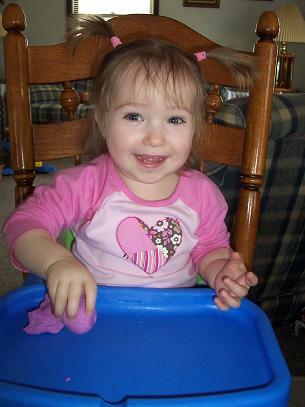 Hailey loved playing with the playdough and it kept her entertained for nearly an hour. Toddlers will also like finding things hidden in the dough, and pushing things into it (straws, macaroni, popsicle sticks, plastic figurines, pretty much anything you can think of). Using cookie cutters to cut out various shapes is fun too. There are a lot of great activities you can do with playdough. Since this was Hailey’s first time using it I decided to keep the activity completely exploratory. 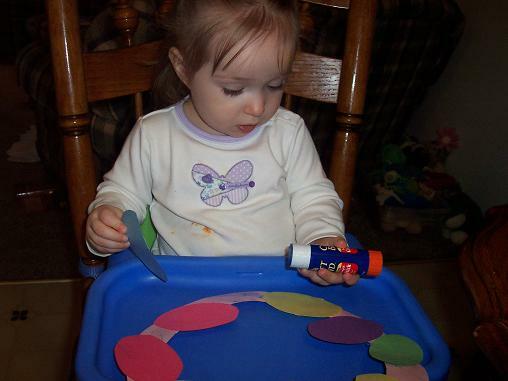 I will post other activities that you can use for playdough as I introduce them to Hailey. 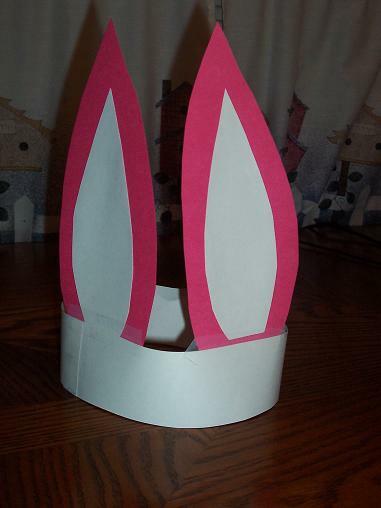 We I made some bunny ears for Hailey. It was very simple to make. Cut a strip of poster board about 2″ wide by about 24″ long. Cut out 2 ears out of poster board each about 8 1/2″ long x 3 1/2″ wide. Cut out 2 smaller ears out of white construction paper. Glue the white ears inside the pink ears. 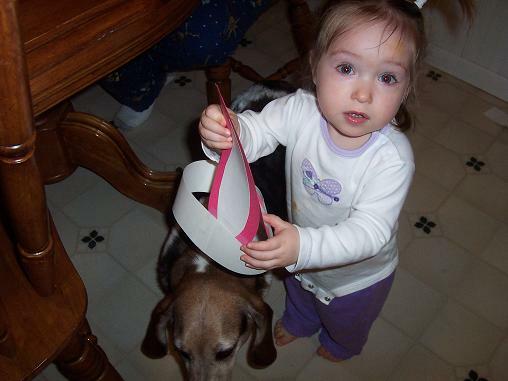 Glue the ears inside the band, positioning to fit behind the child’s head. 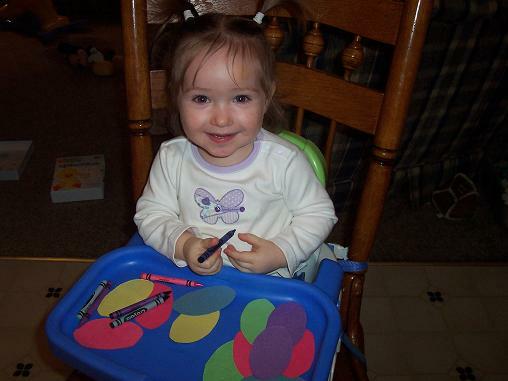 Let the child decorate the head band with stickers, markers, crayons, or colored pencils if they wish. Tape or staple the band to fit the child. Cut off any excess. 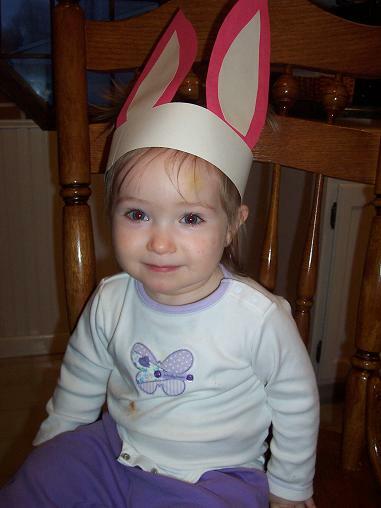 Hailey thought it was more fun to try to get Dottie to wear the ears than for to leave them on. 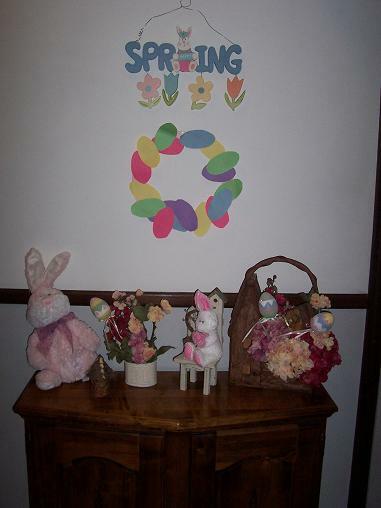 I saw this adorable Easter Egg wreath that Jennifer made with her kids a little while ago. And I thought it was soooo cute. But I thought Hailey might be a little young to try it. Then I saw Andrea do it on her blog too- and her son is only a little older than Hailey, so I decided to go ahead and try it. It was very simple and probably appropriate for any age child. All you need is paper plate or a large piece of card stock, construction paper, scissors, and glue. Cut out the center of the paper plate or the card stock (which is what I used because I was out of paper plates). Cut egg shapes out of different colored construction paper. Then let the kids decorate the eggs with crayons, markers and stickers. Of course I had to cut the “eggs” out (I think age 3 is probably the right time to start allowing children to try out scissors on their own). 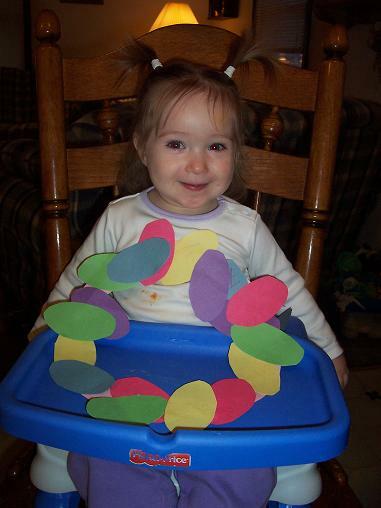 But, Hailey did the coloring and even the gluing herself. While we were working on this acitivity I made sure to talk about the oval shape of the eggs as well as the circle shape of the wreath. I also made note of the colors of the eggs and the colors of the crayons Hailey was using. She LOVED it and cried when we were all done. So, here are some pictures of the fun. Hailey was so proud when she saw her Easter Egg wreath hanging up.